Encouraging healthy practices in children is important because many of the habits developed in childhood stay with them all throughout their lives. One of the best ways that parents can give their kids a good start is to teach them how to eat well and share with them an appreciation for wholesome foods. Indulging in the occasional sweet is certainly not a problem but the bulk of a child’s diet should be nutritionally sound, so parents need to be sure that they stock their fridge and cupboards with a variety of healthful selections. Fresh produce offers terrific nutritional benefits and is readily available at most all grocers. Buying seasonal selections will help keep the family’s budget under control while introducing kids to a constantly changing menu of fruits and vegetables which helps them to develop accepting palates. Family favourites can be purchased year round, frozen or in tins, but utilising fresh produce for recipes as well as for snacking is a good habit to foster. When parents reluctantly give their kids cookies or chips for snacking, they often cite convenience as the main reason since they certainly know that they are not terrific choices, nutritionally. Making fruits and vegetables ready for snacking takes very little preparation time, though, and it is well worth the effort. Many fruits need only a quick washing, and for vegetables and fruits that are not “ready to eat,” a few minutes of peeling and slicing is all that they need. 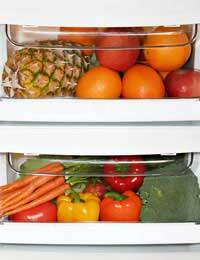 Smart parents keep prepared fruits and veggies in the fridge for their hungry kids and serve fruit dishes for dessert, rather then sweets or baked goods. The benefits of high fibre foods are well known. Fibre aids healthy digestion and because it is bulky, high fiber foods tend to be filling, helping kids to avoid the temptations of less healthful choices. Whole grain breads and crackers (baked, not fried), whole grain unsweetened (or at least, lightly sweetened) cereals, and brown rice are all good choices, offering a wealth of nutrients for a small payoff in calories. While kids do not need to “count calories,” parents need to be careful about letting them fill up on empty calories, meaning those that are high in calories, yet low in nutritional value. Children cannot eat large quantities of food, so the foods that they consume should be chosen wisely. Protein is important for building muscle, vital to growing children. While protein is available in all meats, parents must try to select the best possible protein sources for their kids. Some meats are high in saturated fats, making them less than ideal choices. The best proteins come from lean meats, fish, poultry, eggs, and a number of non-meat sources. Vegetarian friendly sources of protein include nuts and nut butters, grains such as barley and wild rice, beans and legumes, and even some fruits and vegetables. Healthy diets don’t require a great deal of protein, so meats should take up a smaller amount of space on dinner plates than vegetables and grains. This method is not only better for bodies, but it is better for budgets, too! Kids tend to favour soft drinks and fruit juices when they are thirsty, but soda offers nothing to them nutritionally and fruit juice isn’t all that much better. Low-fat or fat-free milk, soy milk, and plain water are best, but unless they get used to drinking water when they are young, many kids simply won’t drink it. Offering water that has just a splash of fruit juice added may convince resistant kids to drink more, but for those who insist on all juice, parents may have to be a bit sneaky. Juice blends can be quite tasty and when the majority of the juice is from veggies with just enough fruit juice to add sweetness, the product is more nutritionally sound. Carrot juice with apple is popular with many kids, but parents can experiment to find the mixtures that their kids prefer. Kids are snackers, and there is really nothing wrong with that. It does matter just what types of snacks that they choose, though, so healthy foods need to be close at hand. Whole grain crackers or pretzels, dried fruits, all-fruit preserves, lean cheese, yoghurt, unsalted or lightly salted nuts and soybeans, and prepared fruits and veggies are all great choices, providing kids with convenient yet healthful between meal snacks. It can help if parents learn to view snacks as mini-meals – most would never consider serving their children a plate of sweets for supper!